Another barge with modules for the latest Type 45 destroyer, HMS DRAGON, under construction at Govan arrived yesterday from Portsmouth. Under the charge of the Spanish tug RED DOLPHIN, the barge was photographed passing BAE Systems' yard at Scotstoun, where the other Type 45 ships are in varying stages of completion. The first, DARING, is continuing her fitting out on the riverside berth. In the nearer drydock, DIAMOND, which entered the River Clyde on Tuesday 26 November, is visible above the bow of the barge. The second ship, DAUNTLESS, is in the further away drydock - the 'golfball' radar on the top of her mast is just visible above the shed, and to the right of the mast aboard the barge. 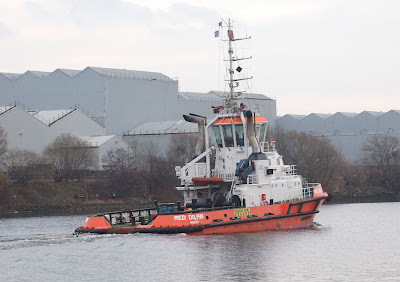 The tug RED DOLPHIN, which until recently was named REMO, is currently operating on long-term charter to Svitzer and is managed by Specialist Marine Services from their base on the Humber. She was built in Spain in 2005, and with her twin azimuth thrusters has an impressive bollard pull of 83 tonnes ahead. She is 35.4 metres long, and has a gross tonnage of 747 tons. You must have been quick. I captured Artistry at Bowling then Red Dolphin at Old Kilpatrick within a short space of time.